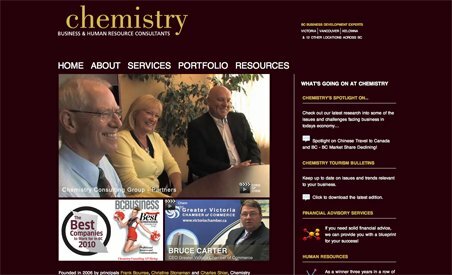 Founded in 2006 by principals Frank Bourree, Christine Stoneman and Charles Shier, Chemistry Consulting Group has grown to become one of the leading business and human resource consulting firms in British Columbia. Their personal, practical approach and our extensive knowledge of local business conditions allows them to provide targeted, relevant advice for your organization. Some of the services that they provide are: Financial Advisory Services, Human Resources Consulting, Economic Development, Business and Strategic Planning, IT/IS Consulting Services, Foreign Worker Recruitment, Program Administration and Conference Event Management.